"The New Adventures of Psionic Lad - Part One"
A strange phenomenon has rendered all of Smallville unconscious and given Conner an almighty headache. Lex Luthor's niece Lori seems unaffected. But that is now and we need to know how we get there so we jump back to a late night after Poison Ivy's plot. Krypto's headache is keeping him up and in turn Conner and Ma. Conner is still pondering the events but Martha doesn't allow her foster nephew to wallow and dispenses some traditional Kent home truths. We jump ahead again to see Lori wandering the halls at school, the students unconscious and Conner unknowingly revealing his identity to her. We jump back and it's the morning, Conner can't seem to shake his feelings of isolation so he turns to a Teen Titan teammate, Bart Allen. Conner feels responsible for the Smallville farmers losing their crops and an idea strikes him. A throwback to his days as a celebrity. A Superboy/Kid Flash charity race. Bart can't discuss the idea further as a mysterious headache has suddenly hit and Conner is almost late for school. When Conner arrives he is met by Simon who is so excited he can't stop himself from discussing their past mission. This prompts Conner to lay down the law. If Simon and Superboy are friends, Conner and Simon can't be. This hits loner Simon very hard. We're back to the present again, and Lori reveals herself to Superboy and helps him up. He is puzzled as to why Lori is invulnerable to the headaches but a time portal suddenly forms before them. Jumping back in the day Conner tries to call Cassie with no luck but as he hangs up the students suddenly begin dropping like flies. Back to the now and the time portal, we see a young South Asian boy in a white and green costume stumble forward. The boy is Psionic Lad and his trips through time via the power of thought cause a psychic backlash that precedes his arrival. He is from the future but not Booster's time nor the Legion's but the year 2216. He also needs help against a team of soldiers, but it's too late as they arrive and attempt to steal back Psionic Lad and that brings us into a loop to where the story began... the end of Superboy. 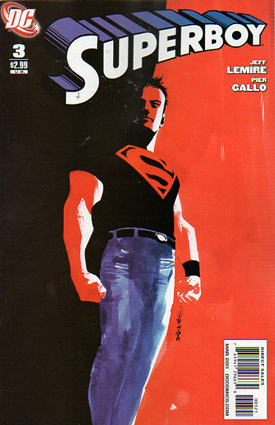 Story - 5: The soul searching in the story is wonderfully reminiscent of Clark's days of growing up super. The plot of the headaches and the time travel twists and turns offer a really fast pace that keeps you really interested, especially when it jumps back and forth around some very strong character development scenes. A brilliant read. Art - 5: The artwork again is a brilliant mix that allows the character moments to breathe and add to the story. The scene with Simon illustrates this books artistic strengths and intricate attention to details that are not part of the script but show real emotion. 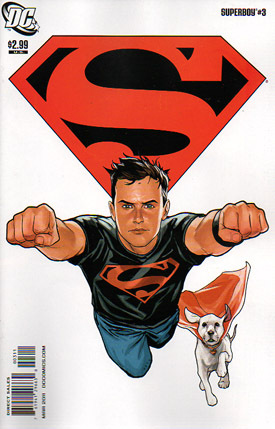 Cover Art - 5: In some art Superboy appears more like a buff Superman, a little like the problems artists have figuring out Kara's look over in Supergirl, so it's nice that Phil Noto remembers that Conner is a high school student! This is my favorite cover of this series, as a character illustration it oozes adventure. Cover Art (Variant Cover) - 4: Here again is the age problem, does this look like a BOY or a MAN? It's a nice color wash but appears to be more of a sketch than a true illustration. Worthy of pin up status but doesn't seem like it's even ready to be cover art.